This JAMF Nation User Conference (JNUC) session posed the question to the audience: if your main office went offline, would you lose the ability to manage your Macs or authenticate your users? Well, thanks to this session, you don't have to! Jason Kuo, IT Support Engineer at Eventbrite, discussed with the crowd how Eventbrite has doubled in size in less than two years—now over 500 users—and how this tremendous growth has led his staff to take a different approach to their IT strategy. He explained how they inverted the traditional, centralized IT architecture by leveraging the principles behind starfish — fascinating organisms that have no centralized nervous system. Throughout his session, he explained to the crowd the three things they need to consider if they want their environment to be more starfishy. This allows them to be more resilient and less dependent on geography, and lets them scale and expand much more quickly. By decentralizing their Mac management and authentication infrastructure, they were able to mitigate potential disruption of a primary office outage. Utilizing JAMF Cloud and driving authentication from the cloud, even if Eventbrite headquarters went offline, all Macs would still be managed and all users would still be able to authenticate to critical services. 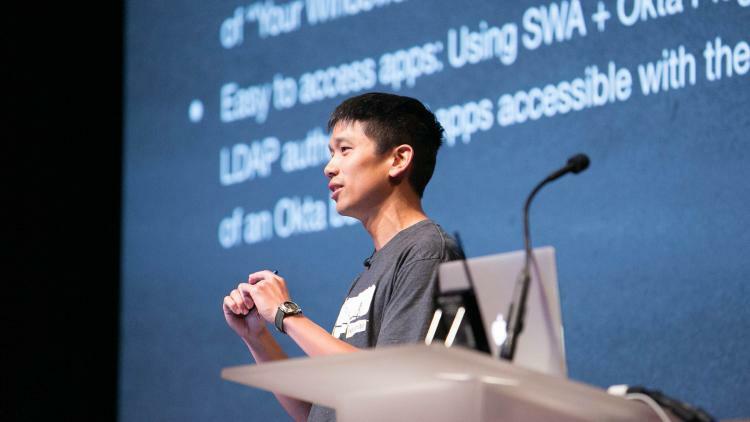 When hosting their JSS in the cloud, they “get the security of having essentially an in-house JSS without having to maintain the server itself,” said Kuo. “If you take out a unit, the organization is unharmed,” says Kuo. To do this, he uses a combination of cloud-centric infrastructure , simplicity, documentation, and the right tools. By utilizing more user-centric IT, he says that IT can empower users to work regardless of where they are or what device they are using. With Kuo's help, an organization's IT strategy will benefit from being more starfishy and more resilient, reproducible, and flexible.